Peter Sampson is a versatile artist who has expressed his creative vain through his projects in a number of diverse fields; from the interiors of luxury hotels, to those of classical apartments, from the layout and décor of offshore platforms to those of liners belonging to the more prestigious cruise companies. The long list of works by Peter Sampson reveals sofas, original looking chairs and many other accessory furnishings, as well as a fascinating hi-tech guitar built by the master lutist Nathan Sheppard. The Esthonian studio has been in the marine business since 1990 working at design, engineering, project management and production of accessory furnishings for interiors. 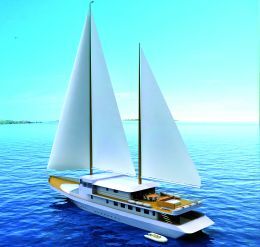 After being initially involved in both the civil and military sectors of large ships, such as ferries, passenger ships, and explorers of over 276 metres, over the years the studio has also specialised in the design of leisure yachts, an easy choice as the market was moving towards larger sizes. Peter Sampson's previous experience naturally favoured his entrance into this market, clearing his way towards working with the biggest names in the business worldwide. Some of Peter Sampson's better known work is the KS "Norge", the 80.2 metre belonging to his Highness Harald V of Norway, for which the Esthonia based studio has supplied the design and furnishings of the interior, MV "Titan", a 60 metre previously known as "Beagle", a British naval vessel which underwent major conversion work, and MY "Ucka", Croatia's Presidential Vessel for which Peter Sampson designed plans and interior. Peter Sampson, who is famous for being quite an eclectic, is able to create designs for any type of interior, going from the traditional to the contemporary to futuristic styles with great ease never being ordinary; this is indeed a virtue we can find in his more recent work the Nereus 50 and the Hylas 50 The first is a typical Ketch-rigged motor sailer of 50 metres, which seems inspired by the sophisticated elegance of the Edwardian Era but with the performance and the safety features of a modern luxury yacht. The layout is decidedly special, the owner suite in the bows on the main bridge is divided into three separate areas, lounge, sleeping area with night views, thanks to a glass panel superstructure and a double bathroom. Below deck we'll find four more cabins sleeping eight guests plus the crews' quarters also for eight including services. Other interesting facilities on board include a dining room, lounge and bar cabinets both inside and out, as well as an hydraulic platform astern. 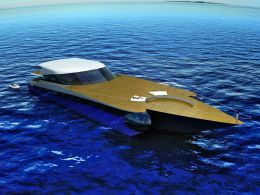 The Hylas 50, in full contrast to the previously described project, is an is a motor yacht of extremes in every detail from the design to its performance. The Hylas is a yacht with no compromizes, a fascinating multi- hull for shapes and layout. The owner suite in the bows is immediately noticeable, taking up the full beam of the lower deck. 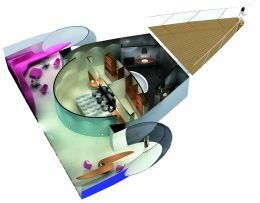 It is divided into three well distinct areas: the night quarters centrally placed and separated by a semi-circular partition, comprising bed, walk-in wardrobe and large en suite bathroom with double facilities and hydromassage; a modern lounge to port and study to starboard, take up the forward spaces in each of the two hulls where each end is characterized by the presence of two glass domes offering 180° views. Another peculiarity of the layout of the main deck rests with the 300 sqm available in the bows for recreational purposes. These last two projects are a clear example of how Peter Sampson is an all round artist, capable of going from one extreme to the other in the least conventional fashion offering a wide range of services, from the design to the supply of the interiors, from the manufacture of furniture to the fitting of teak decks, from the development of new hulls to the supply of complete crafts. For further information: Peter Sampson Design; Karu 14-6; 10120 Tallinn; Esthonia; tel. & fax +372 660 6079; web site: www.peter-sampson.com; e mail sveta@peter-sampson.com, mail@peter- sampson.com.